What does recent biomarker literature say about the likely harm from e-cigarettes? This blog considers recent studies in which the biomarker levels in e-cigarette users (vapers) are compared to those from tobacco smokers. The results are highly variable but all suggest lower levels of risk to vapers relative to tobacco smokers. Yet as the situation with vaping is very dynamic (new products, changing ways people vape) and there is no evidence yet about long-term effects of e-cigarette use on health outcomes, a lot more future research will be needed to get a reasonable understanding of the relative harms. Why focus on biomarker studies? Estimating the potential harm to health from using e-cigarettes is very complex given the ongoing changes and large diversity of e-cigarette products in the international market. How vapers actually use these products is also a likely determinant of what toxicants they inhale. For example, there is evidence that vapers take longer inhalations than do smokers (eg, 1-4). Further, many models of vaporisers have adjustable features such as variable voltage/wattage and air flow. Users may also customise the coil resistance, nicotine strength and flavourings of the liquid used to fill the device. These issues may suggest that past estimates of harm based on e-cigarette aerosol may not reflect the range of exposures users experience at the current point in time (mid-2016). 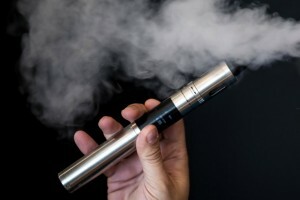 Also past estimates (as per previous reports by Public Health England (5) and the Royal College of Physicians in the UK (6)), largely relied on expert opinion and where evidence was considered it largely focused on studies of vaping aerosol and e-liquid composition with relatively few biomarker studies. So our review of the literature focused on only very recent studies (since 1 January 2015) and just on biomarker studies (a more detailed Technical Report available on request: [nick.wilson@otago.ac.nz]). We assumed that biomarker studies, which measure excreted metabolites (such as in exhaled breath or urine), were more likely to capture the impacts from what vapers actually inhale than studies of just e-cigarette liquids (which may be transformed into other substances when heated), or e-cigarette aerosol (which may not be generated under realistic operating conditions). We included studies regardless of the type of generation of e-cigarette product use (noting the very diverse range of products that go under the term “e-cigarette”). The studies we found suggest a very diverse range of results as shown in Table 1, but all suggest lower levels of risk for vapers compared to tobacco smokers. In particular, the risk associated with carbon monoxide seems likely to be close to 0% or a few percent at most. However, preliminary evidence (ie, one study by Carnevale et al (7)) suggests that the effect of vaping on four other inflammatory markers of likely relevance to cardiovascular disease (CVD) and respiratory disease may be at least half that of tobacco smoking. The results for cancer-related toxicants were variable, from 0% to 23% of the levels observed for tobacco smokers, with most studies reporting between 14% and 23% – a substantial level of exposure. But it is plausible that some of these toxicants could be due to unreported dual use with smoked tobacco (and even exposure to secondhand smoke). * When considering chronic obstructive pulmonary disease (COPD), both acrolein and CO have been described as markers for oxidative damage (amongst a range of other molecules) (19). The US Surgeon General also states the likely role of acrolein in CVD risk (20). NNN and NNAL are tobacco-specific nitrosamines which are relevant for considering cancer risk. Given the evolving nature of e-cigarettes and how vapers use these products (eg, daily amount of aerosol inhaled, length of inhalation, temperature of heating coil etc), a focus on the most recent biomarker studies probably gives the most reliable current estimates of potential chronic disease harm to human health. Nevertheless, the human biomarker studies to date are still relatively few in number and in numbers of subjects included, and it is difficult to interpret the results in terms of long-term disease risk. The study showing raised levels of oxidative stress is a preliminary study that requires replication and confirmation. It is also difficult to interpret the potential biases in work funded by tobacco/e-cigarette manufacturers – as discussed elsewhere (21). Further work to improve such estimates could be obtained from considering other types of biomarkers eg, those considering the expression of inflammatory response genes in vapers (8). There are also laboratory studies of relevance which suggest that e-cigarette aerosol may have constituents that could be harmful to human tissues in terms of triggering inflammatory responses (22), causing cytotoxicity (23), and inducing oxidative stress (24). However, the validity of these studies are also reliant on the aerosol extracts being representative of what vapers are exposed to and translation into disease risk may not be straightforward. A review of the animal biomarker studies done to date may also be helpful (we note at least 21 such mouse studies and 17 rat studies in PubMed as per 10 June 2016). However, the relevance of animal models to human health risk is not always clear and it is often difficult to translate these animal model results into a quantitative estimate of human health risk. Similarly, the animals used in these experiments may not be exposed to aerosol levels that accurately reflect human exposure levels under naturalistic operating conditions. Ultimately there is a need for well-designed cohort studies that follow vapers through to actual CVD and other disease incidence and death. There would need to be careful attention to both exposure assessment (repeatedly) and confounder assessment (smoking proper, socioeconomic position, BMI, etc). What might nicotine users wish to do? We are considering using these tabulated results to inform modelling work that attempts to quantitatively weigh the potential harms and potential benefits of vaping. But what might smokers and vapers take from these results? It seems likely that if smokers shift entirely to vaping their risk of chronic disease would be expected to decline. But if they stay vaping long-term – then they may still be exposed to some notable level of toxicants that are hazardous in terms of cancer, cardiovascular disease and possibly long-term respiratory disease. The safest option for smokers using vaping to reduce their health risk would be to limit the duration of dual use with cigarette smoking (ie, switching completely to vaping as soon as possible) and to also limit the total duration of vaping with a goal of reaching abstinence from both smoking and vaping, wherever possible without relapsing to smoking, which represents the greater risk to health. Lee YH, Gawron M, Goniewicz ML. Changes in puffing behavior among smokers who switched from tobacco to electronic cigarettes. Addict Behav. 2015;48:1-4. Spindle TR, Breland AB, Karaoghlanian NV, Shihadeh AL, Eissenberg T. Preliminary results of an examination of electronic cigarette user puff topography: the effect of a mouthpiece-based topography measurement device on plasma nicotine and subjective effects. Nicotine Tob Res. 2015;17(2):142-149. Behar RZ, Hua M, Talbot P. Puffing topography and nicotine intake of electronic cigarette users. PLoS One. 2015;10(2):e0117222. Talih S, Balhas Z, Eissenberg T, Salman R, Karaoghlanian N, El Hellani A et al. Effects of user puff topography, device voltage, and liquid nicotine concentration on electronic cigarette nicotine yield: measurements and model predictions. Nicotine Tob Res. 2015;17(2):150-157. McNeill A, Brose L, Calder R, et al. E-cigarettes: an evidence update. A report commissioned by Public Health England. London: Public Health England, 2015. Carnevale R, Sciarretta S, Violi F, Nocella C, Loffredo L, Perri L et al. Acute impact of tobacco versus electronic cigarette smoking on oxidative stress and vascular function. Chest. 2016;(E-publication 21 April). Martin E, Clapp PW, Rebuli ME, Pawlak EA, Glista-Baker EE, Benowitz NL et al. E-cigarette use results in suppression of immune and inflammatory-response genes in nasal epithelial cells similar to cigarette smoke. Am J Physiol Lung Cell Mol Physiol. 2016:ajplung 00170 02016. Hecht SS, Carmella SG, Kotandeniya D, Pillsbury ME, Chen M, Ransom BW et al. Evaluation of toxicant and carcinogen metabolites in the urine of e-cigarette users versus cigarette smokers. Nicotine Tob Res. 2015;17(6):704-709. Kotandeniya D, Carmella SG, Pillsbury ME, Hecht SS. Combined analysis of N’-nitrosonornicotine and 4-(methylnitrosamino)-1-(3-pyridyl)-1-butanol in the urine of cigarette smokers and e-cigarette users. Journal of chromatography B, Analytical technologies in the biomedical and life sciences. 2015;1007:121-126. Wagener T, Stepanov I, Leavens E, Driskill L, Tackett A, Molina N et al. Evaluation of nicotine, carbon monoxide, and total NNAL in cigarette smokers and second and third generation e-cigarette users. [Presentation: PA16-4]. Chicago: Society for Research on Nicotine and Tobacco Annual Meeting, March 2016. McRobbie H, Phillips A, Goniewicz ML, Smith KM, Knight-West O, Przulj D et al. Effects of Switching to Electronic Cigarettes with and without Concurrent Smoking on Exposure to Nicotine, Carbon Monoxide, and Acrolein. Cancer prevention research. 2015;8(9):873-878. Yan XS, D’Ruiz C. Effects of using electronic cigarettes on nicotine delivery and cardiovascular function in comparison with regular cigarettes. Regulatory toxicology and pharmacology : RTP. 2015;71(1):24-34. Ferrari M, Zanasi A, Nardi E, Morselli Labate AM, Ceriana P, Balestrino A et al. Short-term effects of a nicotine-free e-cigarette compared to a traditional cigarette in smokers and non-smokers. BMC pulmonary medicine. 2015;15:120. Walele T, Sharma G, Savioz R, Martin C, Williams J. A randomised, crossover study on an electronic vapour product, a nicotine inhalator and a conventional cigarette. Part B: Safety and subjective effects. Regulatory toxicology and pharmacology : RTP. 2016;74:193-199. Pacifici R, Pichini S, Graziano S, Pellegrini M, Massaro G, Beatrice F. Successful Nicotine Intake in Medical Assisted Use of E-Cigarettes: A Pilot Study. Int J Environ Res Public Health. 2015;12(7):7638-7646. Washington-Krauth S, Burns T, Walters R, Arouni A. Assessing the impact of vaping on current e-cigarette users’ blood pressure, heart rate, and carbon monoxide levels in comparison to the impact of cigarette smoking in current smokers. [Poster Presentation: POS1-101]. Chicago: Society for Research on Nicotine and Tobacco Annual Meeting, March 2016. Pulvers K, Emami A, Romero D, Nollen N, Benowitz N, Ahluwalia J. Tobacco consumption and harm exposure of cigarette smokers switching to electronic cigarettes. [Poster Presentation: POS3-161]. Chicago: Society for Research on Nicotine and Tobacco Annual Meeting, March 2016. Antus B, Kardos Z. Oxidative stress in COPD: molecular background and clinical monitoring. Current medicinal chemistry. 2015;22(5):627-650. US Department of Health and Human Services. Chapter 8: Cardiovascular Diseases. In: The Health Consequences of Smoking—50 Years of Progress: A Report of the Surgeon General, 2014. Rockville, MD: US Department of Health and Human Services, 2014. http://www.surgeongeneral.gov/library/reports/50-years-of-progress/sgr50-chap-8.pdf. Pisinger C, Dossing M. A systematic review of health effects of electronic cigarettes. Prev Med. 2014;69:248-260. Rubenstein DA, Hom S, Ghebrehiwet B, Yin W. Tobacco and e-cigarette products initiate Kupffer cell inflammatory responses. Molecular immunology. 2015;67(2 Pt B):652-660. Ji EH, Sun B, Zhao T, Shu S, Chang CH, Messadi D et al. Characterization of Electronic Cigarette Aerosol and Its Induction of Oxidative Stress Response in Oral Keratinocytes. PLoS One. 2016;11(5):e0154447. Lerner CA, Sundar IK, Yao H, Gerloff J, Ossip DJ, McIntosh S et al. Vapors produced by electronic cigarettes and e-juices with flavorings induce toxicity, oxidative stress, and inflammatory response in lung epithelial cells and in mouse lung. PLoS One. 2015;10(2):e0116732. This entry was posted in Uncategorized and tagged e-cigarettes, tobacco, vapers, vaping by Kate Sloane. Bookmark the permalink. There is some scientific literature on this topic – which also tends to suggest lower levels of air pollutants from vaping than tobacco smoking eg, this full free text article: http://www.tumorijournal.com/article/comparison-between-particulate-matter-and-ultrafine-particle-emission-by-electronic-and-normal-cigarettes-in-real-life-conditions But it may also be an evolving situation – given the rapidly changing devices and ways people vape. I am surprised that you have not discussed the potentially (for some) harmful impact of propylene glycol which is used in these e cigarettes. I have a reaction to this when applied to my skin and my breathing is affected when around vaping. Hi Wendy – This brief biomarker study review focused only on major toxicants that are likely to be associated with long-term conditions such as cancers and cardiovascular disease. There is also a need for similar reviews of short-term impacts – eg, as per reactions some people have to propylene glycol or particular flavourings etc, but also how vaping may impact on people with asthma. There is certainly much that the research community could be doing to inform the best regulatory approach that modern societies should take to vaping. This is why Hecht et al do not conclude that their findings are suggestive harm. I’ve been vaping for well over a year now and did so to quit smoking which has been 100% effective – I never purchased tobacco again and never relapsed into tobacco smoking. There are a few things that could be useful to further study. One thing I have noticed is that the nicotine strength of the juice can have a big impact, I had to reduce the strength as it was knocking me around a bit, it is easy to puff more on the e cig than a traditional smoke. Also, I use the refillable cartomizers, something to look into is whether or not the toxins increase as the cartomizers wear out (usually 3-5 days) as they can take on a distinctly “burnt” taste and sometimes nausea follows with repeated use of older cartomizers. It’s possible that the coil starts burning flavoring residue rather than atomizing the fluid correctly. The mini tanks last longer, but the same flavor change does occur which is obviously coil related. The synthetic filling that holds the juice in the cartomizers could also be a potential source of toxins if it is able to be heated by the coil. I’d be happy to answer any questions about my experience if it is of any use to your studies. This is a nice methodology and analysis, but the interpretation is wrong. Biomarkers of NNAL and acrolein are present in non-smokers too, but this is not addressed. The acute effects on inflammation and endothelial function from the study by Carnevale et al. should be discarded. There is no biomarker in cardiovascular medicine which has any prognostic value when measured after an acute intervention. Similar acute effects are observed after exercise (a beneficial factor, preventing cardiovascular disease) and after caffeine intake. In fact, it is clearly mentioned in the guidelines that FMD should be measured after abstaining from stimulants intake (including alcohol, caffeine and nicotine) for 3 hours. More to come in my blog comment.